Washington: Ahmed Mohamed, the 14-year-old Texas boy who became a cause celebre after he was detained and handcuffed for taking a homemade clock to school, visited the White House on Monday for its second astronomy night. After Ahmed's detention on Sept. 14, President Barack Obama invited him to bring his clock to the White House. 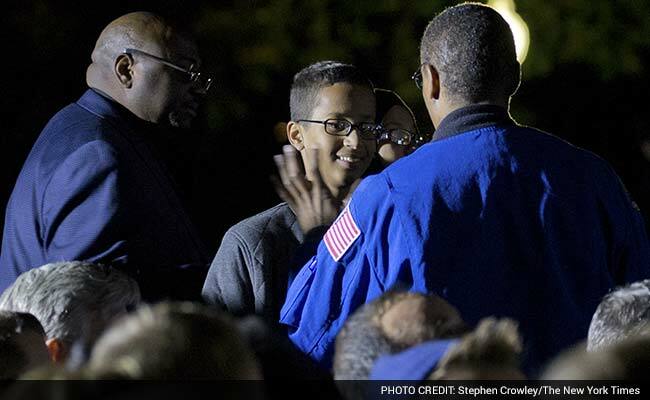 "Cool clock, Ahmed," Obama said on Twitter, adding: "We should inspire more kids like you to like science. It's what makes America great." While Josh Earnest, the White House press secretary, said earlier on Monday that Obama did not plan to meet with Ahmed, the president did speak briefly with the boy and gave him a hug. Ahmed made his way to the front of the crowd after Obama delivered a speech. Ahmed's detention played into national debates about Islam, immigration and ethnicity. Ahmed, who called himself a tinkerer, said he had built the digital clock at his home in Irving and had taken it to school to show it to his engineering teacher. The teacher said he liked it but told him not to show it to other teachers. Ahmed's visit capped a whirlwind month during which he traveled to Mecca, visited Google, and met with Queen Rania of Jordan, Prime Minister Ahmet Davutoglu of Turkey and even President Omar al-Bashir of Sudan. Al-Bashir has been charged with genocide by the International Criminal Court in connection with the widespread killings in Darfur. When he flew into Sudan last week, Ahmed wrote on Twitter, "I am coming home." Ahmed's father, Mohamed El Hassan, immigrated from Sudan and twice ran for that country's presidency. Ahmed has been sharply criticized by conservative media outlets for visiting al-Bashir. Sen. Ted Cruz of Texas, a Republican presidential candidate, said on Sunday that Obama had shown more respect to Ahmed than he had to law enforcement officers. Earnest said that the president had made clear his respect for the police.